The photo above shows the remains of the church where I worshiped two years ago. Although the people there have never known true freedom, what they are dealing with now is more intense persecution than most of us will ever know. This building was filled with pews and people who loved God. Their infraction on society was that they worshiped someone other than who those in power believe is the true God. I have just returned to America, but cannot wait to go back. And as I prepare to do so, I am excited for what God has planned. Each day I turn on CNN or read the New York Times, praying that my friends are okay—that they made it another day. Recently a close brother made a rather innocent statement about the church in America. He said he hated the fact that the church is always under oppression. He was referring to the outspokenness of heretics such as Joel Osteen and others whom have lost their way to the temptations of this world, sometimes in a hurtful manner. We cannot equate this aggravation with faith in Christ. I couldn’t help but think about the difference in our concept of oppression versus that of our brothers and sisters abroad. To them, oppression isn’t inconvenience, verbal abuse, or even heresy—it’s about when the enemy runs into their homes and drags their children into the streets or shoots them while they are singing praises to God. Sometimes it mean’s mom or dad go to jail for professing in Christ as Savior. Other times it may be a barrage of bullets spewed into a living room, killing a family member. 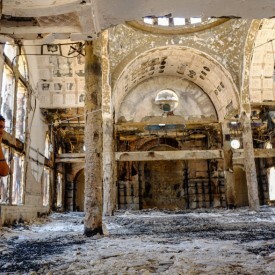 Some of my friends are being injured, while others have lost loved ones when their churches have been burned to the ground like the one in the photo. Perhaps husbands and wives have been shot at a funeral procession while paying their respects to those who have been killed in the fighting. I wasn’t there when the killing happened, but I was there. It is real. They aren’t asking for deliverance—they’re asking for strength. This is happening. It’s happening now. Pray, go, and serve. If you can’t go – if you really can’t go, then pray. There is no excuse for not praying. And if there is something you’re supposed to give up to further the kingdom or prevent suffering – do it now. Do it right now. Final warning. Stop pretending it doesn’t matter.